NASA's Curiosity rover mission has found evidence a stream once ran vigorously across the area on Mars where the rover is driving. There is earlier evidence for the presence of water on Mars, but this evidence — images of rocks containing ancient streambed gravels — is the first of its kind. Scientists are studying the images of stones cemented into a layer of conglomerate rock. The sizes and shapes of stones offer clues to the speed and distance of a long-ago stream's flow. "From the size of gravels it carried, we can interpret the water was moving about 3 feet per second, with a depth somewhere between ankle and hip deep," said Curiosity science co-investigator William Dietrich of the University of California, Berkeley. "Plenty of papers have been written about channels on Mars with many different hypotheses about the flows in them. This is the first time we're actually seeing water-transported gravel on Mars. This is a transition from speculation about the size of streambed material to direct observation of it." 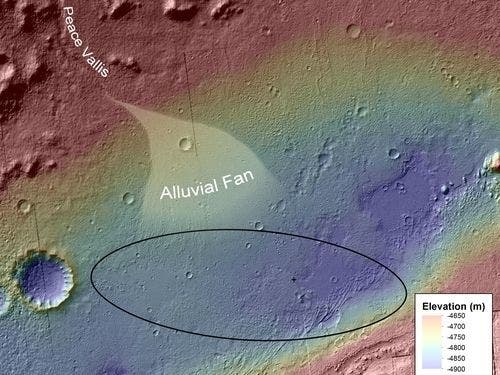 The finding site lies between the north rim of Gale Crater and the base of Mount Sharp, a mountain inside the crater. Earlier imaging of the region from Mars orbit allows for additional interpretation of the gravel-bearing conglomerate. The imagery shows an alluvial fan of material washed down from the rim, streaked by many apparent channels, sitting uphill of the new finds. The rounded shape of some stones in the conglomerate indicates long-distance transport from above the rim, where a channel named Peace Vallis feeds into the alluvial fan. The abundance of channels in the fan between the rim and conglomerate suggests flows continued or repeated over a long time, not just once or for a few years. The discovery comes from examining two outcrops, called "Hottah" and "Link," with the telephoto capability of Curiosity's mast camera during the first 40 days after landing. Those observations followed up on earlier hints from another outcrop, which was exposed by thruster exhaust as Curiosity, the Mars Science Laboratory Project's rover, touched down. "Hottah looks like someone jack-hammered up a slab of city sidewalk, but it's really a tilted block of an ancient streambed," said Mars Science Laboratory Project Scientist John Grotzinger of the California Institute of Technology in Pasadena. The gravels in conglomerates at both outcrops range in size from a grain of sand to a golf ball. Some are angular, but many are rounded. "The shapes tell you they were transported and the sizes tell you they couldn't be transported by wind. They were transported by water flow," said Curiosity science co-investigator Rebecca Williams of the Planetary Science Institute in Tucson, Ariz. 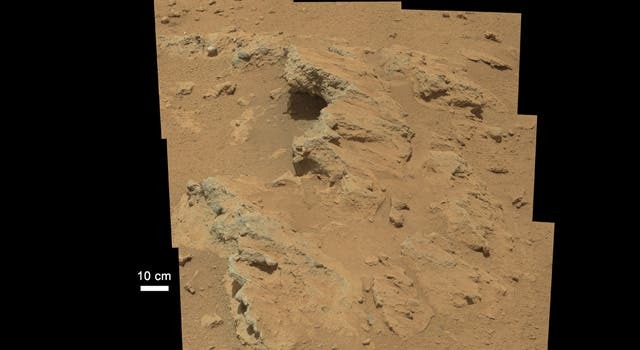 The science team may use Curiosity to learn the elemental composition of the material, which holds the conglomerate together, revealing more characteristics of the wet environment that formed these deposits. The stones in the conglomerate provide a sampling from above the crater rim, so the team may also examine several of them to learn about broader regional geology. The slope of Mount Sharp in Gale Crater remains the rover's main destination. Clay and sulfate minerals detected there from orbit can be good preservers of carbon-based organic chemicals that are potential ingredients for life. "A long-flowing stream can be a habitable environment," said Grotzinger. "It is not our top choice as an environment for preservation of organics, though. We're still going to Mount Sharp, but this is insurance that we have already found our first potentially habitable environment."